It's Etsy Inspirations time again!! 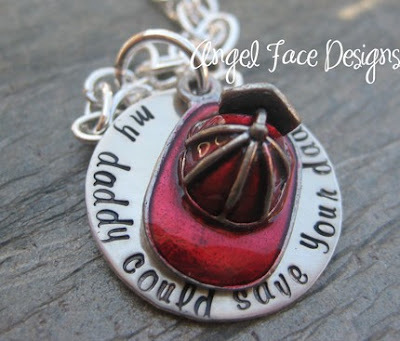 This week's store is called Angel Face Designs & she's offering free shipping to anyone who mentions *Etsy Inspired* in the notes to seller box!! I chose the above pendant as my inspiration and pulled those colors right out of there....had to add black as my color balancer though! Come on & play along with us for the chance to win the Mom2 or Tutu cute necklace. How do you win this week's prize? Visit the above shop, pick your inspiration, make your creation and link it to Ashley's blog. The contest is still going on too peeps. For every challenge you complete this month, you can enter to be June's Guest Designer or to become a permanent member of our Etsy Design Team!!! Read more info on Ashley's blog.......have fun creating and enjoy your prize!!! My next card is for Jazzy Inspirations. This week's jazzy challenge was to make a card using Real Red, Basic Black, Old Olive, Close to Cocoa/Creamy Caramel & Whisper White. I chose to use Close to Cocoa even though I wasn't sure how it was going to work! I just went with the flow here and was smiling by the time I was done.... thank goodness those butterflies were easy to *rock n roll* hugh? Want to be the Jazz Cat of the week? Make your creation using the colors listed above and link it to Tenia's blog. Eazy peezy....have fun and can't wait to see what you all come up with!! Hi, Jackie. Both cards are quite pretty. I would never had thought of adding that green ribbon but it really works :o) The stamps are cute too. Both are wonderful cards, Jackie! Great interpretation of the inspirations! These are fabulous. I love the black & red one and I even like the inspiration piece. Great cards! Love your cards! The EIC shop this week is so great! beautiful cards Jackie!!! :) I love the punch that you used! Looks awesome! :) Thanks for the inspiration! your EIC card is right on!! Love the colors you got inspiration from, of course I love both card!! Love both your cards. I wouldn't have thought of combining those colors, they look fabulous together. Beautiful cards! 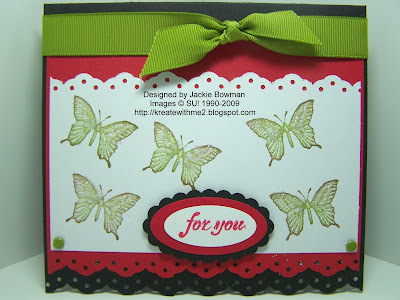 I especially like the butterfly card. Thanks for visiting my blog and leaving such a nice comment. Love what you have done with the inspiration piece. Fabulous card! Very pretty! I love that Peace, Love, Joy sentiment...such gorgeous font! Wow! You did a great job on both cards! I am inspired to make something for the challenge too! What a great gift for my daughter who just had her first baby!! TFS! Jackie, both cards are amazing! You are so good with layers and colors! Both cards are nice. I love the butterfly card. Both cards are spectacular. I love how you repurposed the holiday stamp on your first card. Awesome take on the colors on both cards Beautiful buttefly card. You nailed both challenges! I love that necklace too! GREAT cards! You're work is always spot-on! What a great card.. thank you for sharing!!! Great cards jackie, you are amazing!!! These are both terrific. I like how you used the border punch on each one but they have different looks. I love both of your cards. And the keychain is really cute too. You have such amazing talent...love both cards. Love both of your cards!I especially love the border punches you used (my personal favorite these days)! 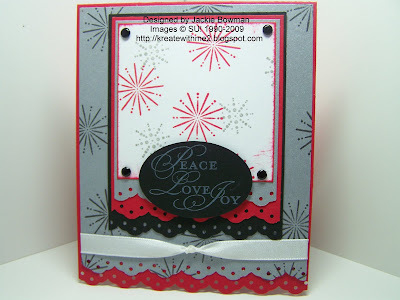 both of these cards are wonderful jackie..i really love your use of black..adn the border punch...TFS! I love how you can find inspiration in the littlest this! Very creative!! Now Jackie I love your style it is so unique yet so so you!!! The way you used those colors and put them together on one card with the layers so so awesome!! I used the same inspiration piece as you but our creations are nothing alike!! LOL!!! Yours is so elegant and pretty and mine is so not!!! LOL!!! Great job on both cards this week Jackie!! I love your cards - there is never one I don't like - and I always am impressed. Again I kind of had to remind myself to breath as your cards always are great!